Posture is something people tend not to think about very much, but the fact is, making even minor improvements to how you sit, stand, and walk can have numerous beneficial effects. Read on to learn a few tips for maintaining good posture throughout the day, whether you’re sitting or you’re on your feet, and find out how you can benefit from better posture overall. Keeps Everything Aligned Properly: Your spine and all of your bones and joints depend on correct alignment for the various systems to work smoothly together. Helps You Fight Fatigue: Poor posture can cause pain and alignment issues, which in turn can lead to sleep deprivation and an overall increase in fatigue. Prevents Lower Back Pain: Sitting or standing improperly can put additional strain on your lower back, leading to symptoms of pain. Wards Off Neck Pain: Headaches that originate at the base of your neck and radiate upwards can lead not only to neck pain but to overall head-related aches; changing your posture can stop these headaches and the associated neck pain from developing. Helps You Breathe More Comfortably: When your diaphragm is in the best position for breathing, you’ll be able to inhale and exhale easily. Benefits Muscles And Joints: When the systems of the body are physically aligned correctly, there is less stress on joint surfaces and ligaments, and muscles don’t end up being overused. Improves Circulation: Poor posture can impair the flow of fluids through your body; for better circulation, improve your posture. Reduces Hip & Knee Pain: Poor posture can lead to muscle imbalances that strain the hips and knees; improving your posture will reduce strain on these regions. Now that you know many of the major benefits good posture can bring you, read our tips for improving the way you sit, stand, or walk. Many of us like to slouch when we sit, but that’s not a good idea. Sitting up straight aligns your spine, bones, muscles, and blood vessels, improving everything from your breathing to your circulation, while decreasing the likelihood of developing posture-induced aches and pains. When you sit down, keep your head upright, your back straight, and your shoulders even. Your hips should be level with your shoulders, not at the edge of your seat! Speaking of your hips, make sure you place your body weight evenly on them. When sitting, this involves keeping your knees bent at a right angle, and keeping your feet firmly planted on the ground. When you’re standing or walking, hold your head high and stand tall! In addition to actually boosting your confidence, this posture will reduce lower back pain and ward off neck pain. When you stand straight with your shoulders back, your tummy naturally tucks in, giving you the added benefit of looking slimmer and trimmer! When you’re standing or walking, high heels are not only an ankle-sprain risk, they’re also harmful to your knees and your lower back. If you decide to wear heels, wear them only during brief periods (such as at a party), and be sure to wear shoes that are good for your feet and all of your body the rest of the time. If your work or your lifestyle requires you to spend a great deal of time sitting, take plenty of walking and stretching breaks. It’s good to change positions (from sitting to standing, and from standing to sitting) to avoid overstressing certain muscles, joints, and bones. Whether you are sitting, standing, or walking most of the day, make sure to maintain good posture for the health of your body. A side note: If you work at a desk, consider getting one with adjustable heights. This lets you work either sitting or standing, and it enables you to change position throughout the day to give your lower back a break and alternate which muscles and bones are being used more predominantly. 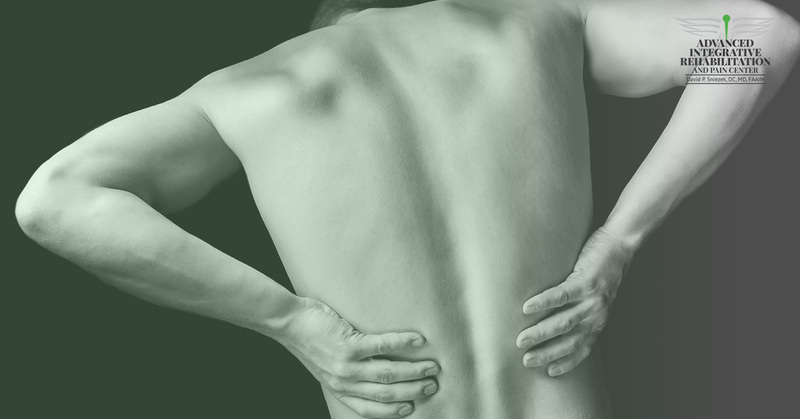 Are you dealing with lower back pain, neck pain, hip discomfort, painful ankles and knees, or wrists that hurt after spending all day using your hands at work? Turn to the health specialists at Advanced Integrative Rehabilitation for professional help. We’re here to apply time-tested integrative medicine care to increase your mobility and comfort while eliminating symptoms of pain. We employ the most effective chiropractic care techniques, along with pain management, medical acupuncture, and other approaches to eliminate pain and improve vitality. Integrative Care: We combine the best therapy approaches from across different health disciplines for a more integrated approach to wellness. Chiropractic Care: Our osteopathic and chiropractic manipulative treatments address a range of issues, in the process fostering healing, improving mobility, and eliminating pain. Acupuncture Therapy: Our medical acupuncture approach promotes wellbeing and can include gentle acupuncture for children, or infertility acupuncture for women. Osteopathy: We can help our patients get the results they want through our proven osteopathic techniques, which involve the medical manipulation and massage of bones, muscles, joints, and ligaments. We serve the greater Washington, DC region, including Virginia and Maryland. If you’re experiencing symptoms of pain, whether chronic or intermittent, know that help is available. Contact Advanced Integrative Rehabilitation today to schedule your appointment!